We are currently accepting applications for this course. International students can apply directly to Victoria University using our online application system, or apply through an education agent. Take your career in business to the next level with a Master of Business Administration (MBA) from Victoria University. Delivered by the Victoria University Business School (VUBS), the Master of Business Administration covers a broad range of business and management disciplines. Tailor your MBA by completing elective units in a particular business area of study. CEO Magazine's 2017 Global Rankings awarded our MBA a Tier One rating by for its excellent lecturers, small class sizes, student diversity, value-for-money and international study options. You can study at our convenient city campus, or complete your MBA 100% online. innovation, knowledge and change management. With our relevant and contemporary course content, taught in the context of workplace scenarios, we develop excellent leaders who understand strategy, innovation and entrepreneurship. Exemptions are available for completed units in the CPA Professional Program and the Charted Accountants – Australia and New Zealand (CA ANZ) Program. Our industry and workplace partners have included Crown Hotels, the NAB, Melbourne Convention and Exhibition Centre, IBM and Tennis Australia. Graduate Management Association of Australia (GMAA). Our Master of Business Administration is offered through the Victoria University Business School (VUBS), located at our City Flinders campus. Featuring business incubators (high-tech meeting rooms replicating a business centre) and industry-standard computer labs, the Flinders campus offers a modern, spacious and comfortable learning environment. You’ll have access to professional online business databases and a specialist business librarian. The Victoria University Business School (VUBS) is located in the heart of Melbourne’s CBD, with study hours tailored to the working professional. You will complete many of your study hours online, and address real issues in the workplace. Our face-to-face classes give you the opportunity to network and collaborate with an engaged and ambitious group of peers. We also give you the option of studying our MBA entirely online, through our flexible and collaborative digital delivery. Get the personal attention needed to achieve your potential as a business leader or manager. We offer small classes where you'll have one-on-one interactions with your lecturers. We also have an open-door policy. Our academics, who have worked in multiple industries, are happy assist you with your study and work-based enquiries. VU’s world-class MBA is now also offered 100% online, removing barriers to time and place. Victoria University Online makes it easy to fit study around commitments such as work and family. Our learning platform gives you simple access to all of your course requirements, at all times. Everything you need to succeed in your studies – including collaborating and learning with peers, meeting with VU facilitators, coursework and assessment – happens online. VU Online is committed to excellent postgraduate-course delivery. At the centre of this is our responsive learning platform, where you can interact with a vibrant community of peers on discussion boards and chat, and receive regular advice and feedback from VU academics and unit facilitators. Studying online allows you to tailor your study pace to your needs. The six study-period model lets you complete as many as six units in a year to graduate faster. You may take a break between subjects if needed, or power through all your units – it’s up to you. Create a customised brochure in a few simple steps. Your brochure will include country-specific information. Master of Business Administration graduates find employment in dynamic middle to senior management roles across finance, IT, marketing, engineering, construction, tourism and sporting industries, both in Australia and overseas. Past VU MBA graduates have undertaken career paths as diverse as joining the United Nations and running successful small businesses. Australian Master of Business Administration graduates receive some of the most generous MBA compensation (salary plus bonus) in the world (QS Top MBA Jobs and Salary Report). 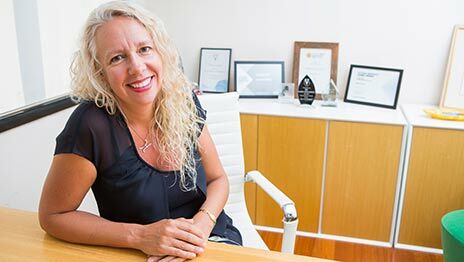 Serial entrepreneur and ‘College of Business legend’, Halinka Panzera proudly gives back to the VU community, for which she credits so much of her career success. 24 credit points elective units. Students to select from any postgraduate units from across the University (subject to availability). Please check any pre-requisite requirements prior to enrolling. 24 credit points Elective units. Students to select units from any College of Business Post Graduate Course (subject to availability). Please check any pre-requisite requirements prior to enrolling. 1. Critically reflect upon theoretical approaches and analyse their application to achieve effective management strategies. 2. Justify and interpret theoretical propositions and related bodies of knowledge to critically evaluate the resolution of business problems and recommend actions relevant to contemporary business settings. 3. Critically apply cross disciplinary knowledge in decision making with creativity for new contexts. 4. Demonstrate accountability in autonomous and collaborative judgements and innovative strategic thinking in response to contemporary and future professional management challenges. 5. Work as a reflective practitioner to formulate, implement and evaluate industry-specific investigations to resolve complex professional problems and inform management decision making. 6. Communicate effectively to specialist and non- specialist audiences including multi-disciplinary teams, diverse cultural communities and business and other professional organisations. 7. Exemplify initiative and leadership in a dynamic 21st century work environment, acting consistently, ethically and socially responsibly. 8. Plan and execute a substantial research based project or evidence-based capstone experience linked to contemporary sustainable, socially responsible and ethical management practices to generate and evaluate complex ideas and concepts at abstract and practical levels. Find out if you meet the entry requirements, including English language and academic requirements. You will be credited for up to 48 credit points of study. Applicants are required to submit a curriculum vitae (CV). Information and fees listed above are for non-resident students. Fees are accurate at the time of viewing and will be subject to annual increases. Some courses require students to purchase equipment or clothing that they will need in the course. These equipment or clothing costs are not included in the course fees listed above and we recommend that you confirm these costs with the relevant college. VU takes care to ensure the accuracy of this course information, but reserves the right to change or withdraw courses offered at any time. Please check that course information is current with the Student Contact Centre.